Malaysia abounds with nature reserves and national parks. The Niah National Park is one of the smaller national parks situated within the state of Sarawak, on the island of Borneo. Being a small park, however, does not mean it is lacking in attractions or importance, for it encompasses a vital archeological site, one where the oldest modern human remains in Southeast Asia were discovered in the 1950’s by Tom Harrisson, the curator of the Sarawak Museum. It is believed that the area of the Niah National Park hosted a major human settlement nearly 40,000 years ago. This is evidenced from the various ancient cave systems present within the park. In fact, the park hosts one of the world’s largest cave entrances (the Great Cave) along with burial sites dating back to the Paleolithic and Neolithic eras. Also onsite are cave paintings from the Iron-Age and the cave known as the Painted Cave features a mural depicting the boat journey into the after-life. 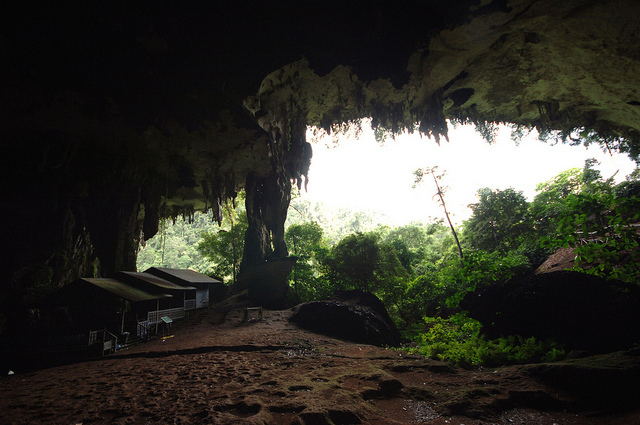 This particular cave was also found to be outfitted with boat-shaped coffins, but these have since then been transferred to the Sarawak State Museum in Kuching. The Niah National park terrain is largely made up of virgin forests and marshland, home to various forms of local flora and fauna like bats, insects, macaques, mouse deer, lizards and various other reptiles, and several species of birds including giant hornbills. The Sungai Niah River flows through the park, which also hosts a small museum on the path leading to its fascinating cave systems. The museum onsite at the park offers much information about the geographical composition of the park’s terrain and about the lives and occupations of the indigenous people who live within the vicinity of the Niah National Park. 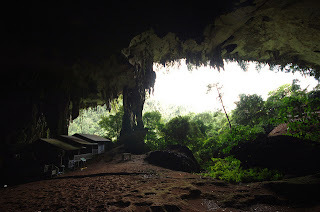 In fact, the caves until today form an important source of livelihood for the local communities who depend on the income generated from the sale of bird’s nests (much coveted as an ingredient in Chinese cuisine) and guano (bat droppings which are used as fertilizer by organic farmers) collected from the caves. The Niah National Park is located at a distance of about 3 km from the small town of Batu Niah approximately 110 km southwest of the town of Miri. The park is easily accessed via a two hour drive from the center of Miri. Most visitors opt to make a day trip to the park; however, if you want to stay on at the park for a few days even that is a viable option for the park offers accommodation choices in the form of air-conditioned chalets and dormitories. The park authorities charge as nominal fee as entrance and photo permits are also required. Fees and permits can be acquired at the Park headquarters located onsite. Licensed guides for walking tours are also available for hire. If you have always wondered about the birth of human civilization, then the Niah National Park is a good place to start your explorations. Sturdy walking shoes as the cave terrain are often slippery with moisture and bat droppings.